I’m not sure which novel was responsible for setting me on the path of a deep and abiding love for dystopia and post-apocalyptic futures. I know that it wasn’t Nineteen Eighty-Fourbecause I remember the first time I sat down to read this book thinking, “I’m going to love this book. This is everything I want in a novel.” And it was. Nineteen Eighty-Fouris one of those novels that, in its very simplicity, takes hold of your mind like nothing else. They say it is a story of one man’s struggle to remain an individual in the face of Big Brother. I say it is a novel for humanity that remains as relevant as it was when it was published in 1949. 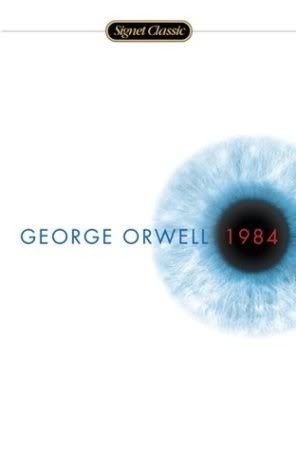 The year 1984 has come and gone, but the threat of a Big Brother-like society is still very real. Many studies have notes how an increasingly technological society loses some of its individuality even as it becomes hyper-public: when one knows everything about a person at the click of a mouse, what is left to learn? Even elsewhere, we see the fingerprints of Big Brother: invasive governments, biased media, governments who want to strip the rights of the people as a way to keep them under their thumb. We see this around the world, but we even see it in the American government. Big Brother is not simply a fictional manifestation of 1949 or even 1984, but one of those transcendent figures whose has entered into the vernacular. My main complaint about Nineteen Eighty-Four is that I wish it were longer. There is so much to this society that I wish Orwell had provided us more pages to roll around in. I’ve read this novel a handful of times, and each time I wish there were more. In some ways though, I imagine that as the beauty of the novel: A short parable which finds its extra pages of material in the fodder of global society. Along with Brave New World, 1984 is one of my absolute favorite dystopian novels. I definitely agree with you that I wish we could learn more about this society. Much of what we learn is through the lens of Big Brother, so there’s always doubt as to what’s true or not. Since you enjoy dystopian literature, I wonder if you’ve ever read “We” by Yevgeny Zamyatin. It might just be the origin of dystopian literature. Excellent read. This was on my to-read list, but you definitely moved it up a couple of places just now! If you liked this book, I bet you would like Anthem by Ayn Rand. Have you read it? It is very short and free on the Kindle. If you haven’t read it yet, you should! Yes I have read Anthem!! Another good book. Fountain Head is on my to-read-someday list.. Cool! And I’ve never heard of that before, I’ll have to look it up! What is it about? And I think I might read Brave New World…. I have no idea what it’s about, either. From Amazon: The Fountainhead has become an enduring piece of literature, more popular now than when published in 1943. On the surface, it is a story of one man, Howard Roark, and his struggles as an architect in the face of a successful rival, Peter Keating, and a newspaper columnist, Ellsworth Toohey. But the book addresses a number of universal themes: the strength of the individual, the tug between good and evil, the threat of fascism. The confrontation of those themes, along with the amazing stroke of Rand’s writing, combine to give this book its enduring influence. I also want to read Atlas Shrugged, which really I know little about as well except that it’s a monstrous book. From Amazon: Atlas Shrugged is the astounding story of a man who said that he would stop the motor of the world–and did. Tremendous in scope, breathtaking in its suspense, Atlas Shrugged stretches the boundaries further than any book you have ever read. It is a mystery, not about the murder of a man’s body, but about the murder–and rebirth–of man’s spirit. Thanks! I haven’t read Atlas Shrugged, but it is one of those enormous books that I plan to read someday! We’re definitely in Threat Continually of “The Big Brother”… Government is way to involved in Our Everyday Life, and whenever we have a “Crisis” in our Country, or in Another Country for that matter, The Government tends to “Stretch” their Arm A Little Longer, and not Retract it afterwards… No… It just sits there, and waits for another moment to Stretch. But if I decide to Convert it Into a Comic Book at some point, which is probably what I would do, I will Clean it up/Flesh it out then. I haven’t read a lot of Graphic Novels, but that one Sticks with me, in fact I have My Copy of it on My Desk, and I haven’t read it in over 10 years… I did Self Publish an 8 Page Comlet (Partial Comic) of a Screenplay of mine that I started to Convert into a Comic Book Script, and Hired an Artist to Draw Me The Cover of Issue #1 and Issue #2, and The First 8 Pages of Issue 1… You can see that Here http://whitejadecomic.wordpress.com/ it also takes place in the Future, but is not a Post Apocalyptic Story… Simply a Story that takes place further in the future. Writing and Publishing Comic Books is basically what I would be doing Full Time if I could Draw, Lol, But I can’t, so it is a Slower Process for me… But I have maybe 4 or 5 Ideas pretty much ready to go should I Create The Opportunity to do so, which I’m working on. Have you read Watchmen? That’s one of my favorites. Also funhome. I’m gonna grab a couple graphic novels from the library to peruse over break. I watched the movie first then read it in class. It really pushes the boundaries of what a graphic novel can accomplish. Really, really interesting for that alone. I’ll have to check it out… To me Graphic Novels are the Next Best Thing to Film… Which is probably why I’ve Shifted from Film Making to Comic Book Writing… To a Degree, I’m still trying to Achieve the same thing… To Get My “Visions” out of My Head, to share them with people. I’ve read Ayn Rand’s books a couple of times (for entertainment, not political reasons). Atlas Shrugged, and The Fountainhead were favorites. Imagine what George Orwell would write about the world wide web! I love to read, and it sounds like you do too! Shannon, thanks for posting this review – reminded me of some special reading and discovering times. I’ve actually read most of those books- not We, Walden Two, V, or Blade Runner, but I’ve seen the film of the latter. Most of the books I’ve read I’ve read outside of school- in my opinion, we read too few books during the school year- 8-10 was not sufficient haha. I remember getting to the last page and feeling genuinely depressed at imagining living in such a society. It was so gripping with the way it sucked you in. I agree with what you have to say about wishing the book being longer. I want to find out more about Air Strip One and the rest of Oceania. I want to find out more about Eurasia and their geographical positions.